Talent, physical fitness, hard work, intelligence, adaptability, mental strength; more attributes can no doubt be added to the list by the most knowledgeable. Coaches from north to south, east to west look for such qualities in young players but how many times do we see a player blossom in the cadet and junior age groups and then not appear in full bloom at senior level? Somewhere, if we make a list of boxes in which you need to score full marks in each, they fall short; two players who gain top marks in each box are China’s Ding Ning and Zhu Yuling. Both are named on the entry list for forthcoming Uncle Pop 2018 ITTF Women's World Cup, play commencing in Chengdu, China on Friday 28th September. Significantly, Ding Ning was crowned World Junior Champion in Linz in 2005; Zhu Yuling won in 2010 in Bratislava and then two years later in Hyderabad reclaimed the title. Since those day both have advanced to senior success; they tick the boxes. In Chengdu, Zhu Yuling is the top seed and defending champion, last year she won in Markham; the level of her consistency in being able to stay close to the table, cover the angles and counter top spin with incredible efficiency, secured victory. At the final hurdle she beat colleague Liu Shiwen, four times the tournament winner, a record that only her illustrious compatriots Wang Nan and Zhang Yining can match. Moreover, she ended the 24 match unbeaten run enjoyed by Liu Shiwen, for Liu Shiwen since making her debut in the tournament in 2009 in Guangzhou, it was her first ever such defeat. Success at the first attempt, for Zhu Yuling, in Chengdu appearing for the third time in the competition, life was very different. In 2015 in Sendai, after recording an opening round win over Hungary’s Georgina Pota, she was beaten at the quarter-final stage by Li Jiao of the Netherlands, it was a major upset. 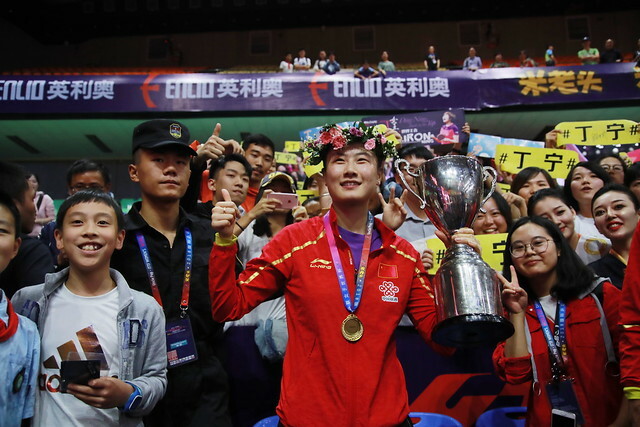 Meanwhile, for Ding Ning, it was a very different debut; in 2011 having won the Women’s Singles title at the GAC World Championships in Rotterdam, she secured the Women’s World Cup title in Singapore. It was the year of confirmation for Ding Ning and above all else the success underlined her mental strength. The previous year she had been a member of the Chinese outfit that had lost to Singapore in the final at the Liebherr 2010 World Team Championships; she lost to Wang Yuegu and that hurt. If it was possible, the Moscow experience heightened her will to win but it was in the Women’s Singles final at the Qoros 2015 World Championships where the desire, the mental strength was seen the greatest. At the start of the seventh game against Liu Shiwen, she twisted her ankle; not able to put pressure on her left leg, somehow she found a way to win. Certainly it endorsed her mental toughness; it also endorsed her intelligence and her ability to adapt. One year earlier in Linz, she had won the Women’s World Cup once again, as in Singapore beating colleague Li Xiaoxia in the final. Notably Chengdu is only her third ever appearance in the competition, Ding Ning is one of only two players with a 100 per cent record of success in the competition. The other is her compatriot, Deng Yaping, the first ever winner when the tournament was staged in 1996 in Hong Kong, different in style to Ding Ning but the will to win, the mental strength the same. For Deng Yaping the record reads six matches played six wins; for Ding Ning it is 10 out of 10, exactly the result you need in each box the be a great player, for Ding Ning it is full marks.